St Helena: 1961 Tristan Relief Fund 5c.+6d., 7½c.+9d., and 10c.+1/-, used on a postcard. bl.uk > Online Gallery Home	> Online exhibitions	> Philatelic rarities	> St Helena: 1961 Tristan Relief Fund 5c.+6d., 7½c.+9d., and 10c.+1/-, used on a postcard. The small island of Tristan da Cunha in the South Atlantic hit the headlines in October 1961 when violent volcanic activity caused the evacuation of the population. The authorities on the neighbouring island of St. Helena, some 1,400 miles to the north-east, started a Relief Fund, and a supply of Tristan da Cunha stamps were surcharged “ST. HELENA Tristan Relief” with an amount for the fund. 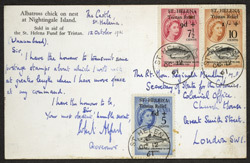 Shown is the post card, bearing three of the four values in the set, sent by the Governor of St Helena to “The Rt. Hon. Reginald Maudling, MP, Secretary of State for the Colonies” informing him of the new stamps. Unfortunalty only the Colonial Office in London could authorise new stamps, a fact clearly unknown to the Governor, and the issue was withdrawn. These are among the rarest of modern stamps as only 434 sets were sold.